Douchebaggery Ranch is proud to have its very own superheroes. (And no, I’m not one of them- I’m just the pitiful Human who is trying to keep up with everyone else day after day.) 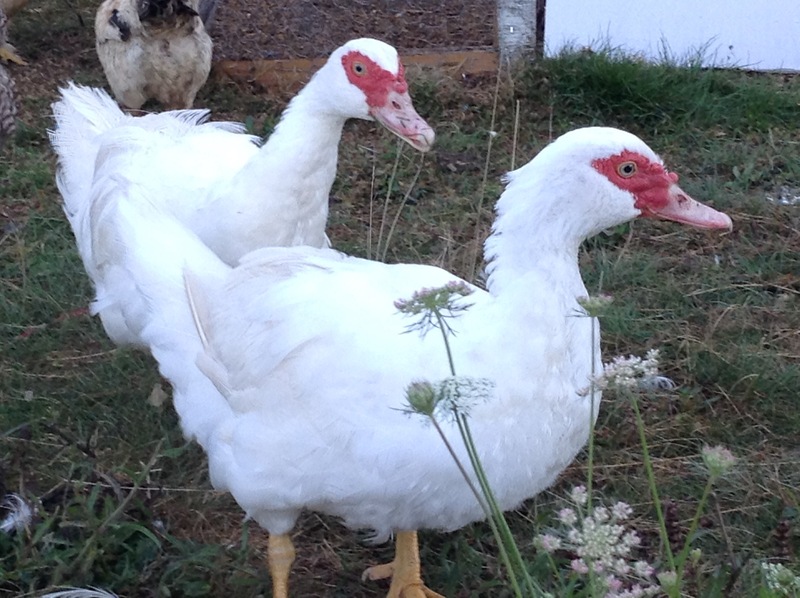 Ladies and gentlemen and everyone else in between, allow me to present Daisy and Daisy, the muscovy ducks. Then why, you might ask, are these douchebags dubbed the Masked Marvels? Let me tell you a story. My garden is in its 3rd season this year, and peas, beans and brassicas are just making their debut. The previous two crops were utterly decimated by slugs. My options were to put down slug bait (strychnine, a particularly awful toxin, various “safe” products that still come with toxicity warnings, or actually safe products that happen to be completely ineffective), set up beer traps (which require a lot of maintenance, and waste perfectly good beer) or find something that eats them. Enter the Daisies. I soon found out that along with the slugs, they cheerfully gobble up all sorts of insect vermin, including catching flies straight out of the air. Right now, the relevant equation is as follows: slugs + flies + food scraps = eggs + meat. How is this not a superpower?! For the records, duck eggs taste “earthy” (ie. gross) when fried or scrambled, but they are AMAZING when used in baking. There’s some information out there about the fat content of the yolks and what have you, along with all sorts of stories about French chefs using duck eggs for baking, but all that aside, seriously, they make damn good waffles and absolutely divine coffee cakes in comparison to chicken or quail eggs. As for meat, that is a discovery I made last year, when I actually had a previous flock of muscovies- one got mauled by a dog, one got ran over (conveniently on a sub-zero day) and two took off one day and never came back. The first two mentioned thus made their way into Freezerland, and were much appreciated on cold winter days in the form of soup and stew. Muscovy meat is nothing like the utility ducks (usually Pekins) I used to roast for Christmas. No fat-filled breast for the muscovy, much to my dismay. However, the meat is dark, and makes a much better substitute for beef than chicken. Duck and barley soup? Duck stroganoff? You name it.